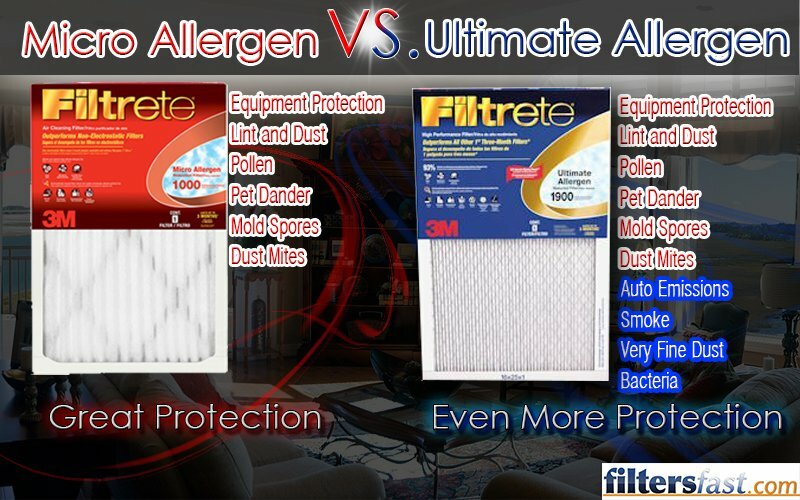 You might be wondering why the above image is showing the differences between the Filtrete Micro Allergen Home Air Filter and the Filtrete Ultimate Allergen Air Filter. As you can see, the Ultimate Allergen provides added benefits and greater protection than the Micro Allergen Air filter provides. Why am I bringing this up? From March 11 – March 17, 2013 you will be able to purchase the Filtrete Ultimate Allergen 6-Pack Air Filter for the same price as the Filtrete Micro Allergen 6-Pack Home Air Filter. In this limited time offer, you won’t have to shell out the extra money to get the added benefits that the Ultimate Allergen provides for you and your family. If you purchase the Filtrete Ultimate Allergen Air Filter through our Auto Delivery program, you will save an additional 5% off your purchase. That’s even more savings for your wallet. Filtrete is the brand many trust for home air filters. The high-quality, durable filters provide your family protection from dust mites, allergens and other harmful air pollutants. For too many in our country, moving up to a better quality air filter isn’t an option in these stressful economic times. The extra money you would have to pay would often go past budget restraints. This is why it is important to take advantage of this Filtrete air filter special and get the Filtrete Ultimate Allergen 6-pack Air Filter for the same price as the Micro Allergen 6-Pack Home Air Filter. You get added protection and benefits for no additional cost. Don’t forget, from March 11 – March 17, 2013 purchase the Filtrete Ultimate Allergen 6-Pack Air Filter for the same price as the Filtrete Micro Allergen 6-Pack Home Air Filter. Use our Auto Delivery option at checkout and save 5% off your purchase. This deal ends March 17, 2013 so place your order today and provide your family with the protection it needs. We have awesome offers taking place throughout the year. Be sure to check back often for the latest promotions and offers from FiltersFast.com.